1) Summer class. H & H Advancement will be here for an informational meeting. Application is accepted on site. See attached flyer and application form. 2) Visa Service, 10am - 2pm in the office. Please note, next service will be April 8. 3) Pre-sale！Hua Xia Chinese New Year Festival set on February 18, is a no-cash based event. Food / drink / games accept tickets only. Pre-sale of tickets starts this Sunday in the office. For every $20 purchase of tickets ($1 each), you will receive a raffle tickets for prize drawing at the Festival. Most importantly, you don't have to wait in line to get tickets on that day. Purchase it now and set go of your youngsters. No waiting. Lots of Fun! 4) !! 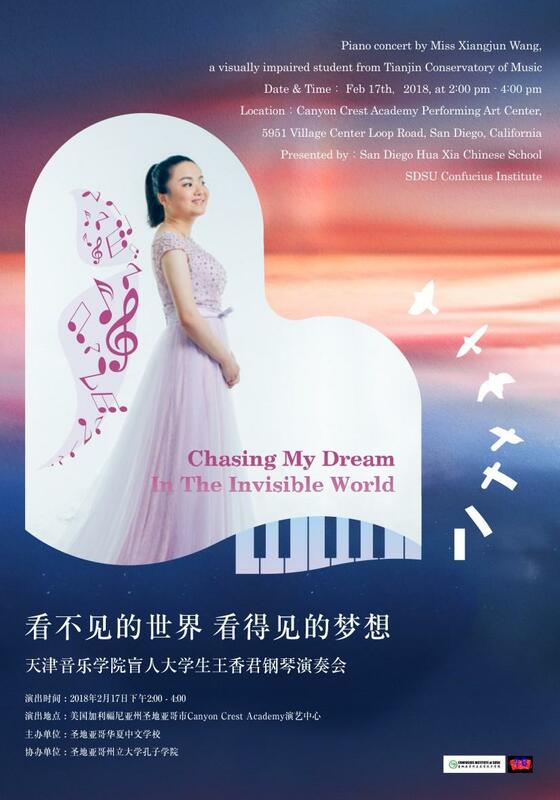 Piano Concert - Chasing My Dream in the Invisible World, by Ms Wang Xiangjun, a junior student from Tianjin Conservatory of Music, China. 5) “寻根之旅” Summer camp more info and instructions attached.